German Hebraist and educationist; born at Hamburg 1725; died there Feb. 28, 1805. One of his ancestors, Joseph Reis, fled from Podolia in 1648 on account of the Chmielnicki persecutions, during which his whole family had perished. After a brief sojourn in Cracow, Reis settled in Amsterdam, where he acquired great wealth, and where he, in 1671, was one of the signers of a petition to the Dutch government requesting permission to erect a synagogue. Together with his younger son, Moses, Reis later settled in Wesel on the Rhine, whence the family name "Wessely" originated. In the synagogue at Wesel are still preserved some ritual paraphernalia presented to it by Moses Reis Wessely, who, upon the advice of the Prince of Holstein, whose purveyor he was, removed to Glückstadt, then the capital of Sleswick. He established there a factory of arms. King Frederick VI. of Denmark later sent Moses to Hamburg as his agent; and while there he transacted important business for Peter the Great also. Moses' son, Issachar Ber, was the father of Naphtali Hirz. 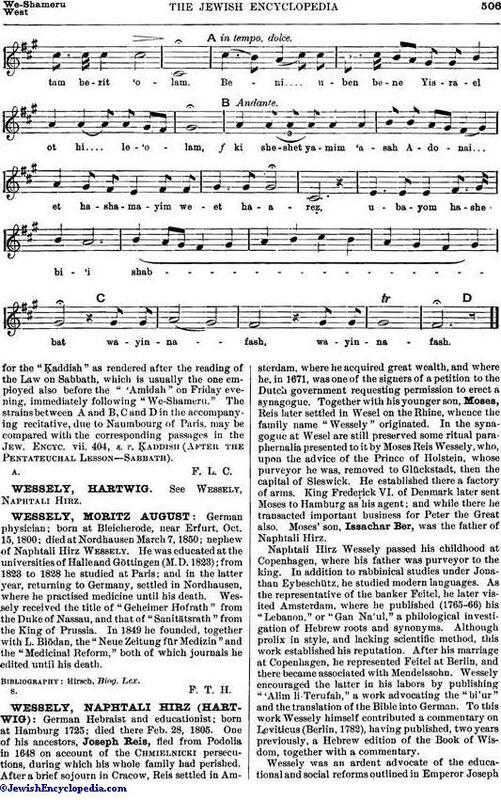 Naphtali Hirz Wessely passed his childhood at Copenhagen, where his father was purveyor to the king. In addition to rabbinical studies under Jonathan Eybeschütz, he studied modern languages. As the representative of the banker Feitel, he later visited Amsterdam, where he published (1765-66) his "Lebanon," or "Gan Na'ul," a philological investigation of Hebrew roots and synonyms. Although prolix in style, and lacking scientific method, this work established his reputation. After his marriage at Copenhagen, he represented Feitel at Berlin, and there became associated with Mendelssohn. Wessely encouraged the latter in his labors by publishing "'Alim li-Terufah," a work advocating the "bi'ur" and the translation of the Bible into German. To this work Wessely himself contributed a commentary on Leviticus (Berlin, 1782), having published, two years previously, a Hebrew edition of the Book of Wisdom, together with a commentary. Wessely was an ardent advocate of the educational and social reforms outlined in Emperor JosephII. 's "Toleranzedict." He even risked his reputation for piety by publishing a manifesto in eight chapters, entitled "Dibre Shalom we-Emet," in which he emphasized the necessity for secular instruction, as well as for other reforms, even from the points of view of the Mosaic law and the Talmud. This work has been translated into French as "Instructions Salutaires Adressées aux Communautés Juives de l'Empire de Joseph II." (Paris, 1792); into Italian by Elia Morpurgo (Goerz, 1793); and into German by David Friedländer under the title "Worte der Wahrheit und des Friedens" (Berlin, 1798). 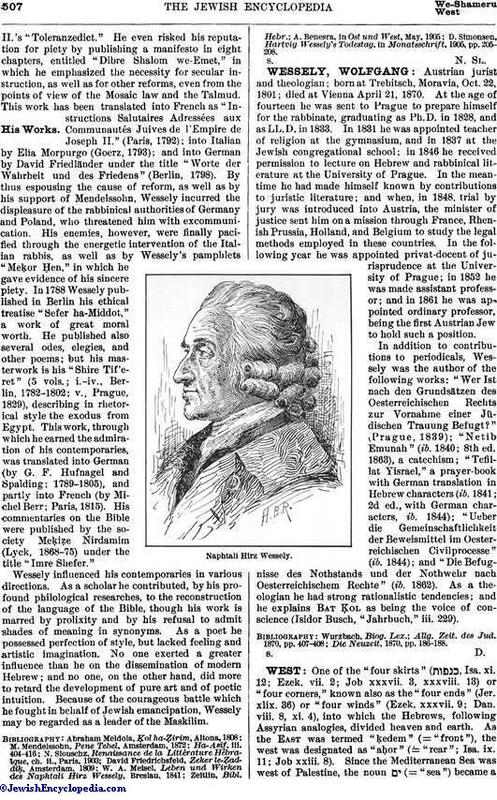 By thus espousing the cause of reform, as well as by his support of Mendelssohn, Wessely incurred the displeasure of the rabbinical authorities of Germany and Poland, who threatened him with excommunication. His enemies, however, were finally pacified through the energetic intervention of the Italian rabbis, as well as by Wessely's pamphlets "Meḳor Ḥen," in which he gave evidence of his sincere piety. In 1788 Wessely published in Berlin his ethical treatise "Sefer ha-Middot," a work of great moral worth. He published also several odes; elegies, and other poems; but his masterwork is his "Shire Tif'eret" (5 vols. ; i.-iv., Berlin, 1782-1802; v., Prague, 1829), describing in rhetorical style the exodus from Egypt. This work, through which he earned the admiration of his contemporaries, was translated into German (by G. F. Hufnagel and Spalding; 1789-1805), and partly into French (by Michel Berr; Paris, 1815). His commentaries on the Bible were published by the society Meḳiẓe Nirdamim (Lyck, 1868-75) under the title "Imre Shefer." Wessely influenced his contemporaries in various directions. As a scholar he contributed, by his profound philological researches, to the reconstruction of the language of the Bible, though his work is marred by prolixity and by his refusal to admit shades of meaning in synonyms. As a poet he possessed perfection of style, but lacked feeling and artistic imagination. No one exerted a greater influence than he on the dissemination of modern Hebrew; and no one, on the other hand, did more to retard the development of pure art and of poetic intuition. Because of the courageous battle which he fought in behalf of Jewish emancipation, Wessely may be regarded as a leader of the Maskilim. D. Simonsen, Hartvig Wessely's Todestag, in Monatsschrift, 1905, pp. 205-208.